This Kenya lot is from the Gondo Cooperative, and is part of the New Kiriti Farmers Cooperative Society in Murang'a County. Kiriti has a couple other Cooperative members - Kayu and Karamahiga - who we also picked up coffee from this year. Murang'a lies to the south of Mt Kenya, just below Nyeri. The cooperative is made up of many, many small holder farmers, most with less than a hectare of planted coffee. The farmers deliver their cherry from the highlands to Gondo where it is wet-processed and then dried on raised beds. Water flow is provided by the nearby river of the same name, "Gondo". Once properly dried, the parchment is trucked down to a miller in Kiambu, several miles southeast, where it is hulled, sorted, and graded. 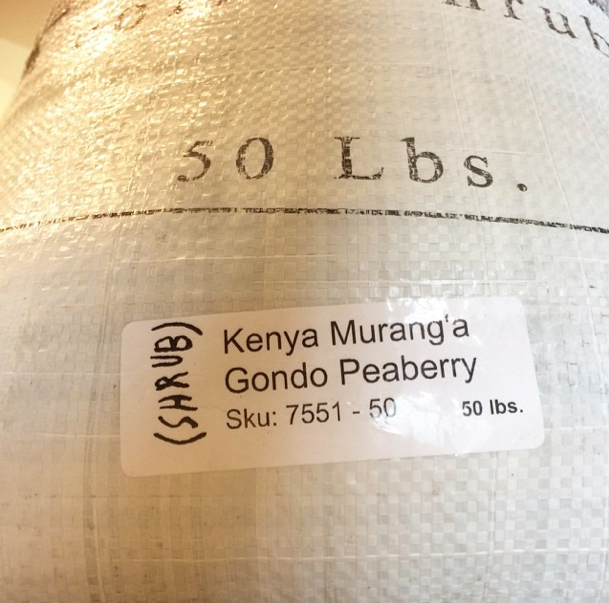 We only saw a few samples from Kiriti this year, and this peaberry lot from Gondo was at the top of the heap. Peaberry's a defect, really, so naturally there's less of it than the flats from the out turn (AA, AB, etc). This lot is only 13 x 60 KG bags, but we got it all. This coffee is part of our Farm Gate pricing program. Gondo's aromatics leave a lasting impression, with nice spiced punch, and a deep, honeyed sweetness. The dry grounds harness a complex smell of berry, tropical fruits, citrus peel, herbal tea, and more! Adding hot water brings on an intense scent of berry/maple syrup, fruited and crystalline sweet, along with guava and candied citrus on the break. This PB lot is bursting with sweet fruit flavors, even all the way up to a Full City roast. City roasts have quite the list of tropical fruit notes - guava, papaya, mango, and floral passion fruit. It's like fruit nectar, thick and juicy. Gondo has a brightness that is on the citric side, like pink grapefruit or pomello citrus, tart and lively. There's the bittering aspect of the aforementioned citrus that is present too, adding even more depth to this complex cup. Black tea and bergamot florals carry through into the finish, definitely leaving us on a high note (pun intended). Our City+/Full City roast seemed to boast a bit more of a lemon-lime citrus note, burned sugars, and a continued allusion to tropical notes. This is one juicy cup of coffee, and will also make an intense and delicious SO espresso.